~Endless Journey~: Filem: Oh Merong~! This is the first Malaysian movie that really impressed me with the story line, accessories and actors. Nothing to say, but thumbs up to KRU Production for producing this kind of story. After watched this movie, I really wanna know the real history behind this story. Is that based on a true story or just an imagination? And now I think that I knew where is the truth. 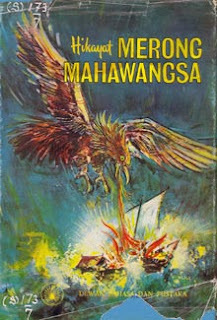 Hikayat Merong Mahawangsa (HMM) is a collection of story from Kedah (a state in Northern Malaysia), and maybe it was not only imagination, but a legend that should not be forgotten. Please read HERE for further info on the real story of HMM. The Summary of the movie was taken from HERE. How can Merong is the one who really fluent in using English although he was living in his ship and sailing from place to another place ? Why Embok was not properly dressed ? because it was known that the Malays at that time preserved the dress code of young woman. Why should most of the Malay stories always used black magic as an issue to be disunited? It should be nice if this movie emphasize some Islamic teaching that practiced by previous generations, and tell about the coming of Islam to the Malay land.